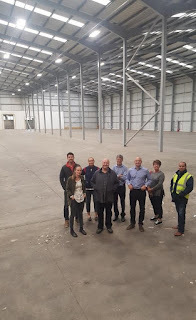 ITM Power, the energy storage and clean fuel company, is planning to bring its two Sheffield facilities together at new multimillion pound factory premises, and an unamed site in Rotherham looks like it is leading the way. The firm is now targeting large scale commercial applications and needs new facilities to meet demand. It has a backlog of £40m worth of projects under contract or in the final stages of negotiations. A further £180m+ worth of projects have been identified. 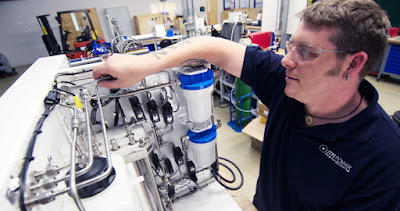 ITM Power manufactures integrated hydrogen energy solutions and was the first United Kingdom-based fuel cell company to go public when shares began trading on AIM in 2014. Ten years of R&D lead to the company's first product sale in 2011 and the subsequent focus has been on optimising and scaling up product at a commercial price point. ITM's electrolyser is a converter of energy rather than an energy store. It has been used to help create a hydrogen refuelling station network in the UK - including a pioneering site on the Advanced Manufacturing (AMP) in Rotherham. It was recently announced that Shell and ITM Power will build the world's largest hydrogen electrolysis plant at Rhineland refinery, Germany, with a peak capacity of 10 megawatts (MW). The renewable chemistry and refinery market is the next target - where capacity could hit 100MW. As part of a transition from relying on grants to commercial sales, ITM launched "Project Cavendish" to investors last year. £29.4m was raised with a share placing to address the two main barriers to growth - working capital and new premises. New premises were identified which could increase capacity, consolidate the company on one site and provide a 5MW power supply. ITM Power currently has a 10,000 sq ft Manufacturing and Testing Facility at Attercliffe and a Development Facility on the Sheffield Business Park. The firm is close to securing £400,000 from the Sheffield city region's Business Investment Fund for its expansion. Using part of the £350m Local Growth Fund (LGF) allocation, the funding is for companies demonstrating growth or potential to grow, creating new jobs. McLaren Automotive's 75,000 sq ft development at the AMP secured £12m from the same fund. An update on the SCR CA Business Investment Fund shows that the ITM Power project totals £4.2m of investment and comes under the Rotherham local authority. It has an employment impact of 50. The firm said in previous statements to the stock exchange: "In line with the company's growth strategy and manufacturing plans, the order backlog and opportunity pipeline demonstrates a clear trend towards bigger unit sizes and larger scale industrial applications. "The backlog is also reflective of the company's focus on commercial sales and shift away from its previous reliance on grant income. In order to accommodate the increased numbers and size of units in production, Heads of Terms are being negotiated for a relocation to a larger facility which will accommodate all functions of the company." A further update in January added that those heads of terms had been agreed. The increase of power on-site will allow testing of larger systems and having the whole company under one roof is expected to create synergies. It could provide the capacity to build 300MW a year of electrolysers. Graham Cooley, CEO at ITM Power, said: "Our strong pipeline growth reflects the hydrogen and energy storage markets' rapid growth worldwide and ITM's focus on commercial sales. We have larger systems, compliant to operate all over the world, placing ITM Power in a great market position. This is a very exciting time for the energy industry, and ITM Power is at the forefront of a market which will revolutionise air quality and energy storage for future generations. "The company's pipeline of deals has more than doubled since last year showing strong and consistent growth in both the refuelling and power-to-gas markets."